Reception 6 p.m. / Dinner & Program 7 - 9 p.m. 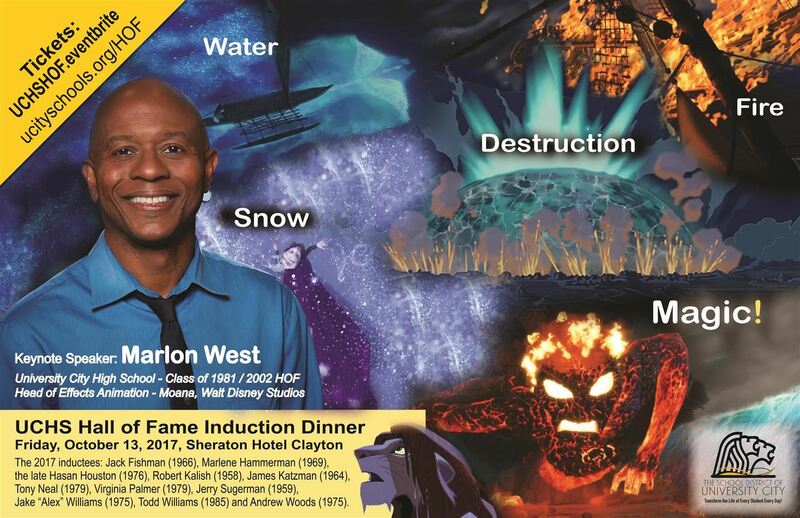 Award-winning animator Marlon West, lead Disney effects animator – Moana, served as keynote speaker for the induction ceremony on Friday, October 13. West graduated from UCHS In 1981 and was inducted into the HOF in 2002. Alan Spector (UCHS Class of 1964 and 2011 HOF inductee) will serve as moderator. Andrew Woods (1975), president, Andrew Woods & Associates, LLC./Public Relations. University City High School’s 2017 Hall of Fame celebration recognized all inductees present at the Oct. 13 ceremony - especially include the 2017 inductees (in alphabetical order) Jack Fishman (1966), professor of meteorology, department of Earth and Atmospheric Sciences, Saint Louis University; Marlene Scheinkman Hammerman (1969), social justice and women’s rights activist; The late Hasan Houston (1976), UCHS tri-sport athlete, Chicago Bears, commodities broker, federal probation officer; Robert Kalish (1958), journalist and author, “Bloodrun” book series; James Katzman (1964), co-founder, Tandem Computers, Inc. and private investor in high tech companies; Anthony “Tony” Neal (1979), president and CEO, Education Equity Consultants; Virginia E. Palmer (1979), U.S. Ambassador to Malawi; Jerry Sugerman (1959), conservationist; Jake “Alex” Williams (1975), television production; Todd Williams (1985), assistant professor, department of Music Education, Indiana Wesleyan University; and Andrew Woods (1975), president, Andrew Woods & Associates, LLC/Public Relations. Nomination Information - deadline for next induction cycle is last Friday in January 2019. Questions: Call Communications Office at (314) 290-4001 or email communicaions@ucityschools.org.